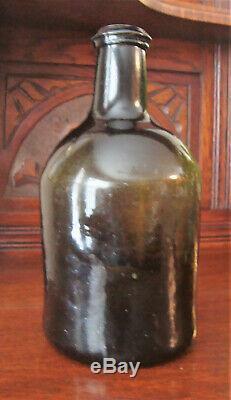 This is a absolutely beautiful stunning condition (Olive Green) Black Glass Wine Bottle Circa 1820. 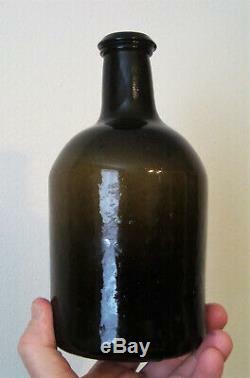 These are tough to find this nice no chips or cracks, take a look at the picture of me holding this bottle, very nice been in my personal collection for years. The pictures are taken from different angles and different light to show how this Olive Green glass can look like it's Black thus the term Black Glass. 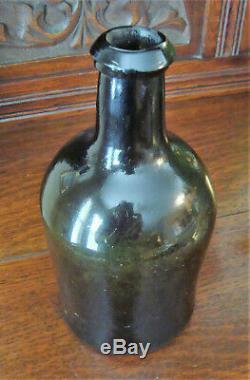 This bottle stands 8" tall, has a base diameter of 4". 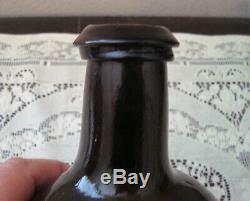 The top of the bottle does have an applied top. 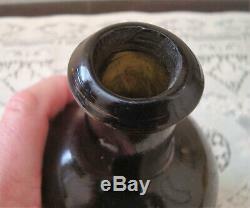 The picture of the bottom of the bottle clearly shows the iron ball pontil mark from the Glass Blower as evidenced by the ring of rough glass. 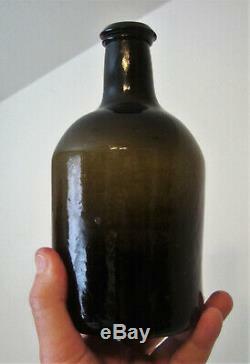 The bottle has no cracks or stars, it's one of the nicest you'll find. The photo of the top shows the beautiful slope to the top. We have been in business for 30 years if you have any questions feel free to contact me I will answer them as soon as possible. This is a very nice addition to any collection. 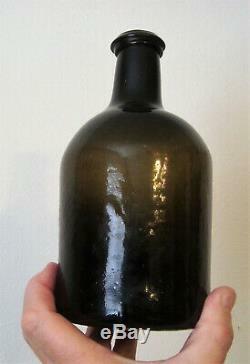 The item "Early 1800 Antique Wine Bottle Olive Green Black Glass" is in sale since Saturday, April 6, 2019. 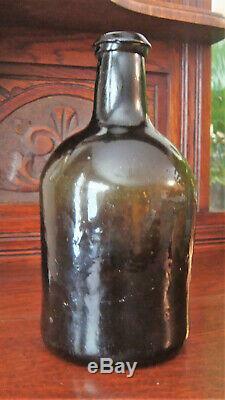 This item is in the category "Collectibles\Bottles & Insulators\Bottles\Antique (Pre-1900)\Liquor". 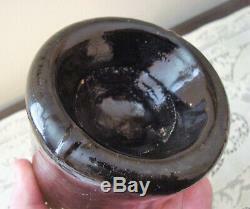 The seller is "fastswimmer" and is located in Kenner, Louisiana. This item can be shipped to United States, Canada, United Kingdom, Denmark, Romania, Slovakia, Bulgaria, Czech republic, Finland, Hungary, Latvia, Lithuania, Malta, Estonia, Australia, Greece, Portugal, Cyprus, Slovenia, Japan, China, Sweden, South Korea, Indonesia, Taiwan, Thailand, Belgium, France, Hong Kong, Ireland, Netherlands, Poland, Spain, Italy, Germany, Austria, Bahamas, Israel, Mexico, New Zealand, Philippines, Singapore, Switzerland, Norway, Saudi arabia, Ukraine, United arab emirates, Qatar, Kuwait, Bahrain, Croatia, Malaysia, Chile, Colombia, Costa rica, Panama, Trinidad and tobago, Guatemala, Honduras, Jamaica, Antigua and barbuda, Aruba, Belize, Dominica, Grenada, Saint kitts and nevis, Saint lucia, Montserrat, Turks and caicos islands, Barbados, Bangladesh, Bermuda, Brunei darussalam, Bolivia, Egypt, French guiana, Guernsey, Gibraltar, Guadeloupe, Iceland, Jersey, Jordan, Cambodia, Cayman islands, Liechtenstein, Sri lanka, Luxembourg, Monaco, Macao, Martinique, Maldives, Nicaragua, Oman, Pakistan, Paraguay, Reunion, Uruguay.